In order to participate in our auctions, you must first register. This is free and takes less than 30 seconds! 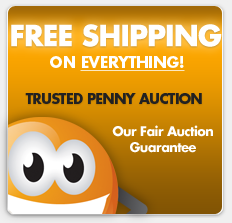 Each bid raises the auction price by $0.01 and resets the clock for a maximum of 25 seconds. Be the last to place a bid when the timer counts down, and you win! Bids start at just $0.75 each and can be purchased for even less with Orange’s Daily Deals! I did not win, now what? Orange has got you covered! Use the buy it now option and get the item you wanted delivered for free, plus all the bids used on the auction returned instantly at no additional cost!